This post will focus on having the technical prerequisites ready and in place for a successful Domino/Notes migration. Before going into any details, if you are planning to do a migration from Domino and want to use Dell Software’s Notes Migrator for Exchange, it is important to mention that there is a requirement from the vendor to use certified people for the project. I recommend using three accounts, one with Domino permissions, one with Active Directory (AD) permissions and one with Exchange permissions. The Domino account should be Manager for all .NSF files (database files), Editor on the NAB (names.nsf) and Reader on all users archive files. Create a new migration account in People & Groups, select the directory and People. On the right hand side, press People – Register. 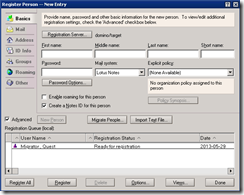 Fill in a proper name, I typically create an account called Quest Migrator as shown in the example below. Finally, press Register. For the AD account, it’s recommended to be a member of “Domain Admins”. However, this is not a requirement, because delegated permissions can be used. The important aspect is that the AD account have “Full Control” over the OUs where user objects are located. The AD account also needs to be a member of “View-Only Organization Management”. 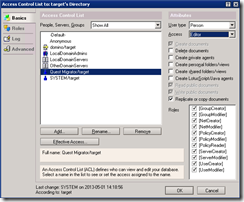 If using the provision feature within Notes Migrator for Exchange (NME), the AD account needs to have “Full Control” over the OU where the contact objects are located as well. More information about the migration performance and throttling can be found by reading the provided link in the end of this post. Another thing to keep in mind is the configuration of the Throttling Policies and the Windows Remote Management. If you are migrating to Exchange 2010, make sure to configure the Throttling Policy according to the configuration below. Also make sure to configure the Windows Remote Management with the following settings. If you are migrating to Exchange 2013, the throttling policies have been changed. Create a new throttling policy and assign it to the migration mailbox “SA-MIG”. Notes Migrator for Exchange leverages SQL for saving user information (and much more). The Native Client needs to be installed together with SQL Server 2005 or SQL Express 2005, or newer. I do prefer running at least SQL 2008 R2 and I would recommend using the SQL Server instead of the Express version, since you have more flexibility of creating maintenance jobs for example. A little heads up if you are about to run a large migration, make sure to take full backups of the NME40DB so that you have a copy of it, if anything happens and also for having the logs truncated. In smaller migration projects the SQL Express version works fine, I would still recommend taking full backup of the database or dumping it to a .bak file and then backup the .bak file. Configure the account “Domain\SA-NME” as DBCreator, for allowing it to create the NME40DB during the setup of Notes Migrator for Exchange. 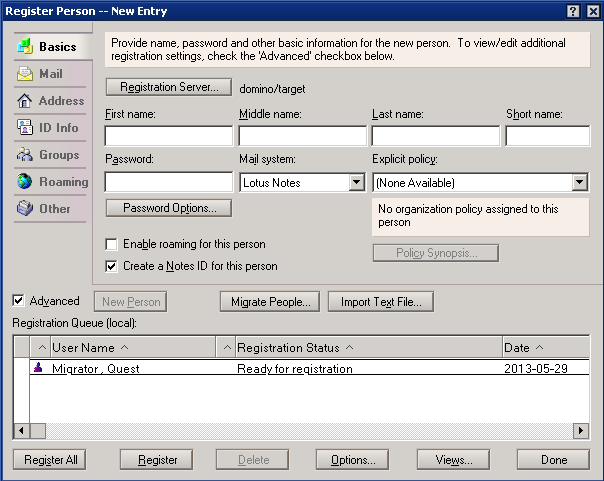 I would recommend you to use the latest Lotus Notes client. In my last projects I’ve been using version 8.5.3 Basic or Normal client. An important thing to never forget is to install Lotus Notes in single user mode. Make sure to install the .NET Framework 4 since this is a prerequisite for NME. I would recommend upgrading it to the latest service pack level. If Antivirus is installed, make sure all Quest folders and %temp% are excluded from any Antivirus scans. If not it may result in slower performance and potential disruption of migrated content. Most likely, there will be a mail gateway of some kind in the environment which takes care of the antispam. In those situations, antivirus and antispam are already addressed in the Domino environment. On the target side, Exchange probably has antivirus and antispam solution installed as a second layer protection to the Transport services. As a result, I have not encountered any problems when excluding a couple of folders for the migration from scanning process. Outlook 2007, 2010 and 2013 are all supported. I’ve been using Outlook 2010 in all my projects and it have been working very well. 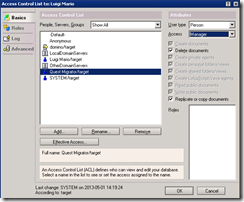 Configure Outlook with the “SA-MIG” account, since this is the account that will insert migrated content into the Exchange mailboxes using the Receive-As permission. I’ve been learned to create and configure a Outlook profile using the SA-MIG account. Make sure to configure it for not using the cached-mode. However, in theory, a profile should not need to be created in advance, because NME creates temporary profiles during the migration. However, this step shouldn’t hurt anything either. It’s recommended to disable UAC on all migration servers. This is done in the Control Panel under User Accounts, Change User Account Control settings. Make sure to set it to “Never notify” and then restart the sever. It’s highly recommended to disable DEP, so make sure to do that. Also, make sure to restart the server when this is done to allow it to take effect. If you choose to delegate the permissions instead of using the Domain Admin group for the SA-NME account, then it is required to add the SA-NME account into the local administrators group. During the migration, the folder names (Inbox, Inkorgen etc.) are created based on the regional settings on the migration console. So, for example, if you are migrating a UK/English mailbox, make sure to configure the regional settings to match this and for example, if migrating a Swedish mailbox, set it to match the Swedish locale settings. With this said, I would recommend migrating users using the same language at the same time. And then change the regional settings on the migration console and continue with another region. Migrating to Office 365 is like a normal migration, besides the target is a cloud service which can be a bit special. The Admin Account Pooling Utility (AAPU) is used for getting better throughput performance. The AAPU tool provides a workaround by using different migration accounts for each migration thread, instead of having one migration account with a throttling limit, you could have ten migration accounts which would give 10 migration threads in total. You can have up to 10000 migration accounts (NME 4.7.0.82). If you are going to use the AAPU, you should add the parameter below into the NME Global Defaults or Task Parameters. * For the last two items in this list, the tenant admin should take the total number of threads across all migration machines and add a buffer, because it is difficult to predict the timing of the Runspace initiation. It is best to assume that all potential Runspaces could be created within a minute, so the values for both items should probably both be submitted as the total number. More information about migration performance and throttling can be found by reading the provided link at the end of this post. 445 Out NetBIOS/SMB Quest NME servers All Domino mail serversDomino Qcalcon serverQuest NME master server Microsoft-DS/NetBIOS traffic for Migration. For reaching SMB shares. Note: Not required, but recommended. Network Monitoring or Wireshark may sometimes be your best friend during troubleshooting network connectivity. Portqry is another tool that could be of great value during initial network verification. Read through the release notes and the User Guide (PDF), it is included within the NME zip file. All information is collected into that document. Feel free to comment the post, I hope you liked the information. If you find something that might be incorrect/other experiences, leave a comment so it can be updated. Did you have any issues with the creation of the SQL database? I keep on getting all sorts of permission issues. What creates the database? Is it the settings when connecting to the SQL server of the first time, or is there something else? What kind of SQL are you using?